In the catfish world, almost every continent has had its tough kid on the block. 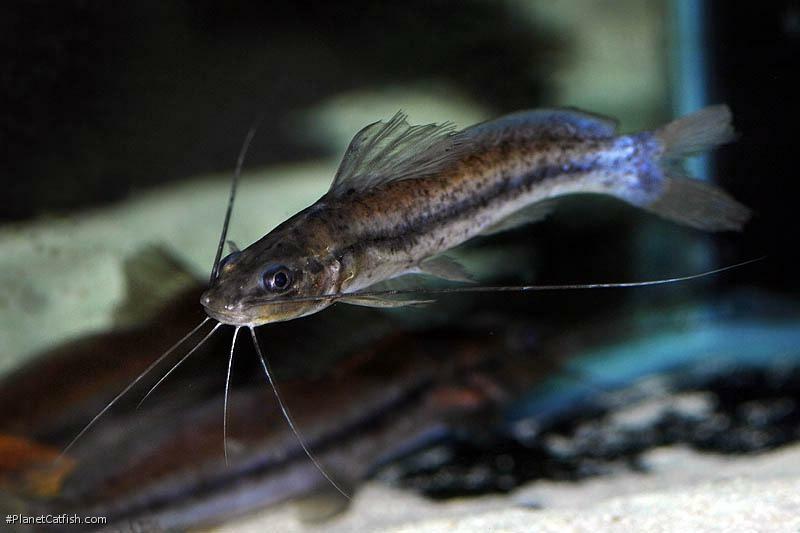 These are catfish that are extremely tolerant of a wide range of water conditions and very often end up being the first catfish for many beginning hobbyists. Once kept, who can forget their common pleco (Pterygoplichthys pardalis) of South America, the walking catfishes (Clarias spp.) of Africa and Asia and the bullheads (Ameiurus spp.) of North America? The subject of this month's article is another toughie, but one that hails from Central America, not a geographic region that one usually associates with high catfish diversity. It's not quite correct to say that Rhamdia is a strictly Central American catfish. Rhamdia quelen is actually one of the most widespread of all South American catfish species, being recorded all the way from southern Mexico to central Argentina. However, it is one the most ubiquitous freshwater catfish found in Central America, hence its association with that region. And where does the tough fit in all of this? Well, this species has been found in a wide variety of habitat types, from extremely acidic blackwaters to the alkaline, hard waters in cenotes (sinkholes). On a personal level, I had two individuals in a tank with a decent layer of fine sand as substrate. The sand eventually developed sizable anaerobic pockets, which led to water suffused with a sizable amount of hydrogen sulfide. The situation persisted for several months, and it was more a testament of the catfishes' constitution than any fishkeeping skills on my part that the catfishes thrived and actually grew in water that constantly reeked of rotten eggs. The smell eventually got to me, and I ended up rehousing the fish in more pleasant conditions. Like many similar looking catfish of its size, the silver catfish is an aggressive, robust species that will eat anything it can swallow comfortably (the upside to this is that it makes for easy feeding). Conspecifics are territorial and if housed without adequate planning for territories, the losing individual will sport bitten-off barbels and torn fins in no time. In short, this is a fish that should share a tank only with large, robust fish. Although widely touted as a candidate for fish culture and numerous culture experiments have also been conducted on the silver catfish (such as optimal culture conditions for fingerlings), it seems that the widespread culture of the silver catfish as a food fish has gotten off to a slow start. Type Locality Between Caño Pastos and Hamburgo, trib. to Río Samiria, Depto Loreto, Peru. Etymology The name Rhamdia is apparently a misspelling of 'nhamdiâ', an orthographic variant of the Tupi-Guarani name for the fish, 'jandiá'. The species is named after the abbe Quelen, who accompanied Quoy and Gaimard on their travels. Size 375mm or 14.8" SL. Find near, nearer or same sized spp. Identification It is distinguished from congeners in having the following unique combination of characters: pectoral fin spine with serrae on both sides, caudal fin lobes subequal or with either lobe slightly longer, posterior nostril velum open posterolaterally, gill raker 5-16, post-Weberian vertebrae 36-44, eye medium sized. Sexing The genital papilla of males tends to be larger and more well developed. Distribution Widely distributed throughout Central and South America, from southern Mexico to central Argentina. Other Parameters Able to tolerate a wide range of water conditions. Feeding Not a fussy eater and will take all manner of prepared and live foods. Will eat smaller tankmates. Furniture Some driftwood/rocks/pipes as hiding spaces. Compatibility Should only be housed with large, robust fish (large central American cichlids are ideal), as smaller tankmates will be eaten. Territorial and aggressive towards conspecifics. Suggested Tankmates Large, robust fish (such as central American cichlids). Breeding Not reported in aquarium, but bred for aquaculture as food fish. Non-adhesive demersal eggs (1.1 to 2.8 mm diameter) are laid down, hatching after about 48 hours at 22°C. Ten days later, the larvae weigh approximately 100 mg but growth is slow (0.5 to 1.15 g per day).